Home / Private Jet Blog by Monarch Air Group / First Class vs. Private Jets: Who Has the Edge? 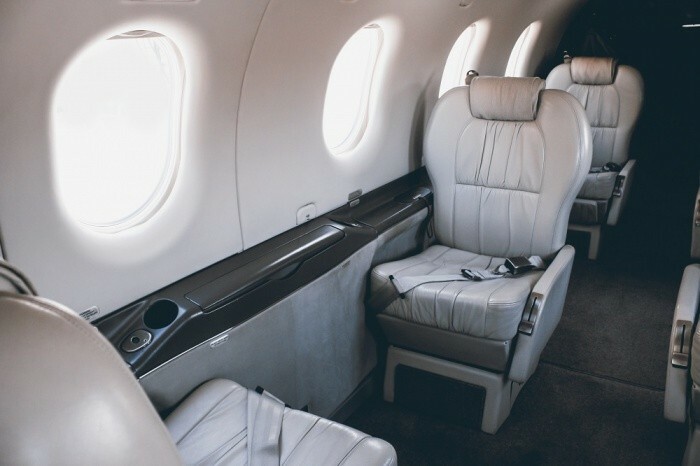 Sometimes dismissed by many beforehand as being too expensive, private jets will usually make you save money in the long run, especially if you were already considering purchasing a first class ticket. Here are the most common factors you need to weigh before you make your decision. A standard first class ticket from Los Angeles to Las Vegas can cost $1,500, while the same trip with a private flight operator like Monarch Air Group might cost up to $5,000. Easy to say, first class has the edge, right? In a commercial flight you have to pay for your seat, so if you want to bring your seven best friends to Vegas you will have to pay $12,000. On a private jet, all 8 can travel for the initial $5,000; you rent the plane and not the seat. The time is money cliché exists for a reason. Money comes and goes, but time can never be made up. When flying on first class the standard rules and regulations of commercial flight still apply; arriving hours prior to the flight, check-in procedures, security, and baggage claim after landing. Now that’s plenty of time… With private flights you just need to arrive 15 minutes before departing; a quick check-in procedure will be in place and after that, you walk directly to your jet. Easily considered within the time factor, the possibility offered by private flights of landing in small regional airports must not be overlooked. When landing at major airports passengers still have to drive a considerable amount of time after a demanding commercial flight in order to reach their intended destination. Domestic or regional airports are usually closer to the traveler’s final destination. Furthermore, the flexibility in scheduling provided by jet operators is one of a kind; you can plan trips at any hour and the jet adapts to your timetable and not the other way around as would be the case with a first class ticket. If you need to conduct work during your travel then some basic conditions need to apply: a comfortable desk, reduced noise and, most importantly, privacy. With first-class seating, there are still passengers around you, flight attendants, children, and noise. Not ideal if you need to take care of important business matters. On the other side, if you are traveling for leisure, well, all the previous factors also apply for a more pleasant and relaxing flight. If you want to discuss private jet options for your upcoming trip, contact us or call our flight experts to get personalized quotes for your flight: 1 954 359 0059.